I am gathering threads for next week’s two lessons on the saints. Nothing is woven together yet. But before sitting with the saints, both lessons share a similar need to begin from a common departure point of what makes a saint a Saint. I am reminded that all Christians living and dead are part of the communion of saints. We are saints in name, if nothing more, trying our best to walk the talk and talk the walk; like St. Paul, we everyday saints openly struggle against doing the evil we do not want to do and in not doing the good we wish to do. But what causes a saint to become a Saint with a capital “S”? What causes a saint to become widely recognized as Saint, if not by the Catholic Church, then at least by a group of spiritual apprentices who regard another person’s words and works as help for their own sacred journeys? With help from St. Julian of Norwich, I am slowly unraveling a few threads of understanding. I have been enamored with St. Julian since stumbling upon her in several works of fiction. I have confessed to enjoying historical fiction, in particular, English history of the Tudor period and of the Medieval period in which Julian lived. After continuing to cross paths with Dame Julian, I read her Revelations of Divine Love a couple of years ago; these mystical revelations came to Julian during a life threatening illness that led her, at around age 30, to turn her back on the world and live out the rest of her life as a holy woman. 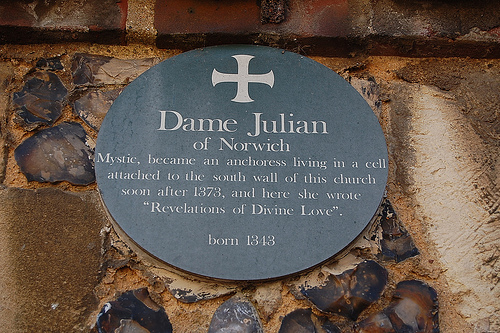 Rather than entering a convent, which was more typical of the time, Julian entered a small cell, a side building attached to the St. Julian and Edwards Church of Norwich, where she remained until she died. The following is a typical summary of her everyday cell life. Julian would have had three windows in her cell or anchorage. The window called the Squint was to open into the church so that the anchoress could receive communion and follow the church services. The second window provided access to her attendant who would deliver food and remove any waste. The third window provided visitors with the means to talk to Julian asking for her advice and prayers. ..Many people visited Julian of Norwich. Not just the local villages but other important Medieval people of the Middle Ages seeking her advice and comfort. Metaphorically, all Saints and saints live with the same three windows that Dame Julian had; a window to take in spiritual nourishment, one for the ins and outs of earthly needs and one to hand out spiritual nourishment to the world. But the windows of the Saints are opened wider, allowing them to hear and see more clearly than the average everyday saint. Through their Squint, they listen and gaze attentively for a word or glimpse of the Holy; in their second window, they more fully experience their own human poverty as they rely on others to bring in food and carry out their waste; and in their third window, they listen — really listen — to the needs of the world and invite the world to see and listen for God in their own everyday lives. Saints are Saints and not saints because they desire God more than an everyday saint. They desire God more than worldly power or money or fame. Perhaps a litmus test for Sainthood is that a true Saint would be as uncomfortable as hell at being called a Saint. Seeing more clearly and maybe standing a little more closer to God, they know just how far they stand from the holy. But to a blind and deaf saint like me, they are holy indeed; holy in the sense of being set apart, accessible by all. True Saints are not pious in the sky. As they live out their quiet lives as they must, Saints come closer to incarnating Christ in the world. There is simply no help for it. Norwich is my nearest big city and I go to the shrine when I can. The atmosphere remains calm and reflective and very comforting. Well. How about that! You are one lucky gal. And I’m glad you have this calm soothing space in your own back yard. Well, not exactly backyard. Norwich is about 40 miles away! I enjoyed this post very much. The book I am about to publish takes its title from the collect from All Hallows(Saints) day in the modern prayer book, and the whole concept of meeting people along the way as Strangers and Pilgrims(the novel’s title) as fellow saints (and maybe Saints but they don’t admit it) has long fascintaed me. Your title sounds interesting. I look forward to hearing more.